Under the umbrella of Subversive Forum a number of events will take place in May 2012 in the Croatian capital, including an international conference dedicated to the main theme The Future of Europe, numerous debates The Crisis of Europe (May 14 – 15), The Struggle for the Commons (May 16) and Towards the Balkan Social Forum (May 17 – 18), the Subversive book fair and, during the introductory week (May 5 – 12), the 5th Subversive Film Festival. With more than 100 participants from Greece, Portugal, Spain, France, Belgium, Germany, Serbia, BiH, Macedonia, Albania, Slovenia, Hungary, Romania, Bulgaria, Montenegro, Austria, Italy, UK, India, Senegal, Hungary etc. It is no news that the European Union is facing its biggest crisis since it was created. It is at the same time an economic, financial, social and ideological crisis of this project. Across the continent, instead of solidarity we are witnessing a resurgence of national selfishness, the rise of extreme right, intolerance, and racism. The Mediterranean countries who have been hit the hardest by the crisis show us also a possible response to it : the appearance of strong social movements demanding social justice, a different economic model, and direct democracy. Almost everywhere we see the youth on the streets, in Greece, Spain, Portugal, Italy, Romania, but also in the future EU member Croatia. Through a critical examination of Europe’s current crisis, the Subversive Forum will try to outline realistic possibilities for its transformation and the creation of another political, social and economic project across the Old Continent. The keynote speakers include Stéphane Hessel, Michael Hardt, Tariq Ali, Gayatri Spivak, Slavoj Žižek, Saskia Sassen, Christian Marazzi, Samir Amin, Bernard Cassen, Ignatio Ramonet, Eric Touissant, Costas Douzinas, Renata Salecl, and more than 100 participants from 20 different European, African and Asian countries. For one week in May, Zagreb, the town placed almost exactly on the EU’s shifting border, will become both a center of the world’s critical thought and a laboratory of possible political, social and economic alternatives. 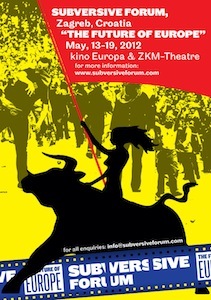 The Subversive Forum is endorsed by the World Social Forum. This post is part of our special coverage Tunisia Revolution 2010-11. The border between Tunisia and Libya has seen a massive influx of refugees since the uprising in Libya began. The journey to the border is long and tough, and for most it doesn't end there. Huge crowds of thousands have been waiting for days in freezing cold weather to cross in to Tunisia. Up to 75,000 people have fled the violence in Libya to Tunisia, since February 20, and even more people are expected. The situation at the Libya-Tunisia border is at crisis point, says the UNHCR. The IFRC have posted this video from Ras Jdir on March 1. Many of the refugees who are trapped at the crossing point of Ras Jdir in Tunisia are Egyptians who lived in Libya. Their compatriots in Egypt have been following the events at the border closely. Thousands of Egyptians at the border crossing of Ras Jdir, in Ben Guerden, in Tunisia, are screaming for help. Please, send this message to the Egyptian government. The situation there is deteriorating and there is fear that a humanitarian crisis may occur. Thanks Tunisian brothers and sisters for hosting your fellow Egyptians. You showed them more solidarity than our careless government! Calls to come to the rescue of refugees in Ras Jdir have been spreading via social media, and campaigns to collect humanitarian aid have also been organised. A call for the NGOs all over the world: the situation is deteriorating at the Tunisian-Libyan border. Help! It's time to show your solidarity, humanity, and responsibility: in Ras Jdir, thousands of people need help. Help them! The Tunisian army is doing great job. The United Nations are impressed. Others, were concerned that the massive flow of refugees pay put Tunisia's interests at risk during a very fragile transition period since the President Ben Ali fled the country. refugee crisis in ras jdir is another threat to tunisia's stability - international help needed quickly. Nach den schlechten Umfragewerten bahnt sich in der FDP ein Richtungsstreit an: Bundesjustizministerin Leutheusser-Schnarrenberger drängt auf einen Kurswechsel - und kritisiert indirekt Guido Westerwelle. University of Illinois Professor Robert McChesney and The Nation correspondent John Nichols, two leading advocates of the media reform movement, join us to talk about their new book, The Death and Life of American Journalism: The Media Revolution that Will Begin the World Again. McChesney and Nichols argue that journalism should be seen as a public good and that the government should help save American journalism by granting more subsidies to newspapers and media outlets. ".... In Berlin und Brüssel wird bereits über einen Europäischen Währungsfonds nachgedacht, der nach Art des IWF operieren und zahlungsunfähige Mitgliedsstaaten, die ihre Lehrer, Busfahrer und Polizisten nicht mehr bezahlen können, mit Krediten unterstützen soll, unter strengen Auflagen, versteht sich. Dass diese Auflagen in erster Linie den Zweck verfolgen werden, die Interessen der Gläubiger zu befriedigen, wissen wir von den sog. „Strukturanpassungsprogrammen“, mittels derer der IWF Jahrzehntelang bedürftige Dritte-Welt-Staaten zu einem rigorosen Sparkurs, zur Streichung sämtlicher Sozial- Gesundheits- Bildungs- und Infrastrukturprogramme sowie zur Privatisierung und zum Verkauf der letzten, noch halbwegs rentablen Staatsbetriebe gezwungen hat. Eine makabre Vorstellung, die aber demnächst Realität werden könnte: [....] chronischer Schuldknechtschaft ausgeliefert sein werden wie so viele Länder des Trikonts gegenüber den Gläubigerstaaten- und Banken des Pariser Clubs..."
".... Inzwischen sind sich die Experten und die Parteien (fast)aller Couleur darin einig, dass der Ursprung der Krise in den deregulierten Finanzmärkten zu suchen ist, die jene Spekulationsblasen erzeugt haben, die jetzt geplatzt sind. Diese Diagnose, so unstrittig sie sein mag, hat insofern etwas Tröstliches, als sich aus ihr ein ebenso einfaches wie plausibles Rezept ableiten lässt: Man muss die außer Rand und Band geratenen Finanzmärkte nur vernünftig regulieren und wieder unter Kontrolle bringen - dann wird sich die Wirtschaft, ist die jetzige Krise erst überstanden, schon wieder erholen, und alles wird wieder gut! Was aber, wenn die Krise ihren Ursprung primär gar nicht in den Finanzmärkten, sondern in der von dieser dominierten Realwirtschaft hat? Wenn also die globale Bankenkrise erst die Folge eine fundamentalen Krise der Kapitalverwertung in der warenproduzierenden Wirtschaft ist?..." Adolf Merckle, one of the world’s richest men, committed suicide yesterday by throwing himself under a train, Bloomberg reports. Financial difficulties, and particularly great losses he suffered on Volkswagen stock, are being cited as the key reason he ended his life: ---- [Merckle's company] VEM was caught in a so-called short squeeze after betting Wolfsburg, Germany-based Volkswagen’s stock would fall. Merckle lost at least 500 million euros on the bets on VW stock, people familiar said on Nov. 18. VEM lost “low three-digit million euros” on VW stock, the company said in November. In part two of their interview, Paul Jay asks Prof. Noam Chomsky to weigh-in on the dominant subject of the day, the economic crisis. While Prof. Chomsky agrees that the current crisis is a very serious one that will have broad implications for the broader society, he points out that the foreseeable Medicare-induced economic crisis will "dwarf" the current one in magnitude. Furthermore, Prof. Chomsky develops his contention that democracy is hindered by unrestrained free markets. While on the other hand, state-restricted markets are democratic by design in that they allow people take control--through their government--of financial institutions to force them to include externalities and risks to the broader population in their decision-making. These factors are such that profit-seeking enterprises will not accommodate them when left to their own volition, given that free markets do not put a price on these externalities.